I’ve been making a top inspired by this outfit from Blake’s 7. For those who weren’t brought up in Britain in the late 70s/early 80s, this was a TV science fiction series known for its dark themes, strong characters, and spectacularly silly costumes. This is one of the more wearable ones. The character is Jenna, who was the spaceship pilot from the good guys in the first two seasons. (Picture from Lisa’s Frame Capture Library). 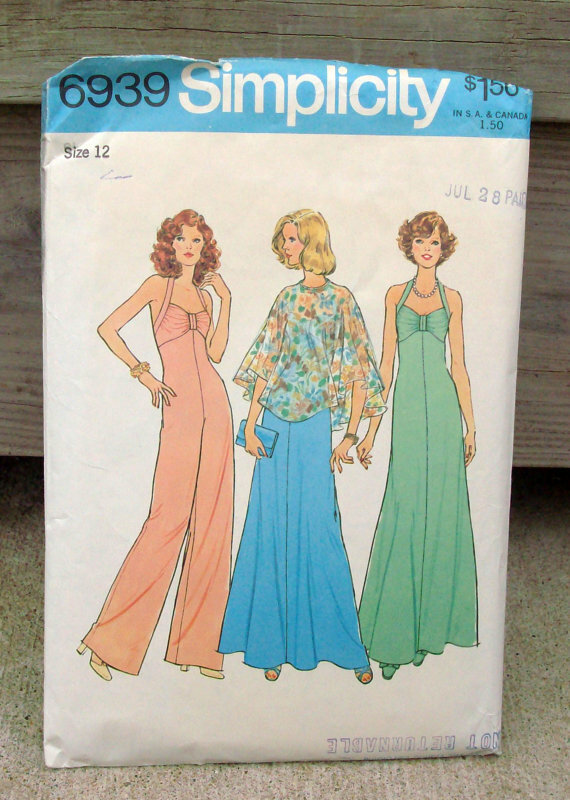 The pattern is the top from Vogue 1195. The fabric is a black and white chiffon bought on Goldhawk Road in London. The fibre content is a mystery. There is no point pressing it, as no amount of heat and pressure will put a crease into it. On the upside, it doesn’t melt even with the iron at its maximum temperature. It frays quite badly and it’s a challenge to get iron-on interfacing to stick to it. I had to press it for twice the time the instructions said. Is there such a thing as Teflon fabric? I replaced the fabric belt with a loop of wide elastic with its ends stitched together permanently. The belt runs inside the top at the back which makes the back hang completely loose, unlike the original. The top has a bound neckline and bound buttonholes for the belt to run through. 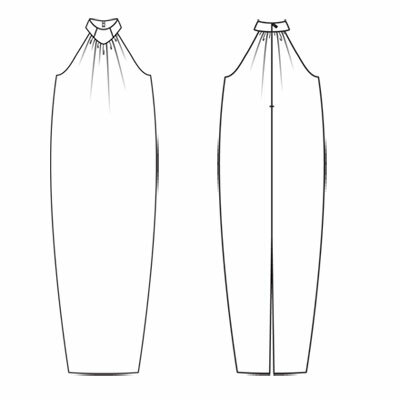 I used Vilene bias tape on the neckline and stabilised the binding strips for both the neck and buttonholes with lightweight knit interfacing; the fabric was far too slippery on its own. This was my first attempt at bound buttonholes and they weren’t as complicated as I’d been led to believe. Not that mine are perfect, but for a first try I’m very pleased with the results. This isn’t the easiest thing in the world to wear. It needs high, chunky heels and leggings (or possibly very skinny jeans) otherwise it looks like a tent. Even with the heels it looks a bit like I woke up and decided to put on a pair of curtains rather than clothes. Still if I am ever called upon to fly a stolen spaceship I have the right outfit now. Funny how things work out with patterns. I bought Vogue 1195 a while ago in a fit of misguided enthusiasm. It’s a pattern for a very simple dress and a big flappy top; I bought it in order to make the top even though it’s really not my style. I never found suitable fabric for it, and then other patterns came along and it slipped off the must-sew list. Regular readers of this blog will know I am mildly obsessed with the 70s/80s BBC TV series Blake’s 7. Recently I realised that one of the more wearable costumes from season two was vaguely similar to Vogue 1195. Here are a couple of shots from http://www.framecaplib.com/b7lib.htm. So I started half heartedly looking for black and white prints but didn’t find anything, and forgot about it again. 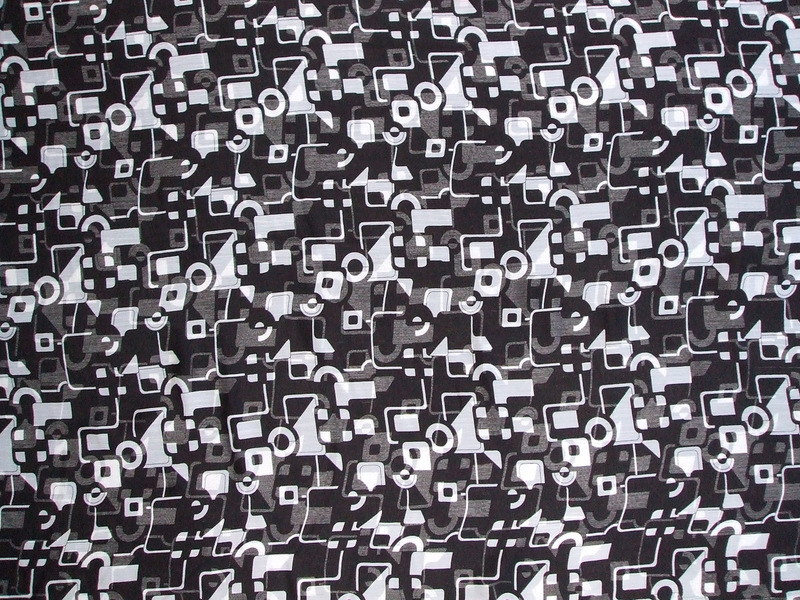 And then on my last trip to London, I found some black and white chiffon in a lovely space-age print that I inexplicably seem to have not uploaded a picture of. Edited to add: here it is! This shot is taken from a distance; I’d guess the short side is about a metre. I think it’s inspired by the work of Eduardo Paolozzi – a sort of mix of organic and machine-like shapes. So clearly the right fabric will come along if you just wait long enough. Pictures of the finished top at the weekend, I hope! I have to get my high-heeled boots fixed first for the full late 1970s lady space pilot look. I love BurdaStyle magazine but I confess I was a little disappointed by the March 2011 issue. It’s the wedding special so I can’t say I was really surprised – I’ve been married for nearly twelve years, so I’m not likely to want to to make a wedding dress any time soon. 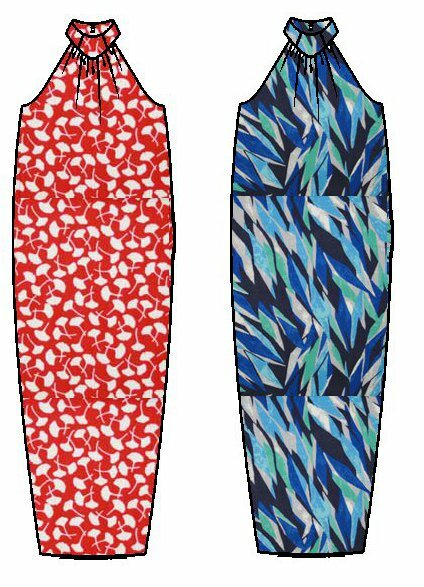 You can see the the styles here on the French Burda site, although that URL doesn’t look stable to me so who knows how long it will last. 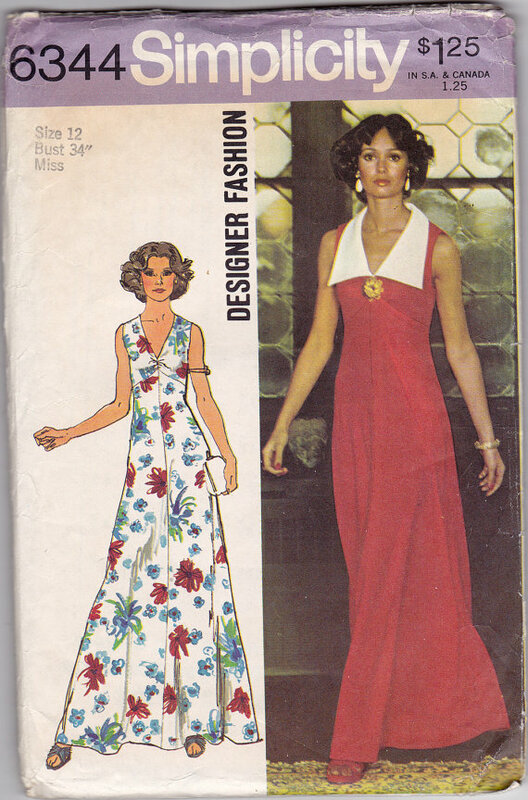 The rest of the issue was OK but nothing leapt out at me as a must-sew. However my eye kept being drawn to model 106, which is one of the wedding dresses. I’m not quite sure how to describe it. Sleeveless, floor length, and, well, egg-shaped. Here’s the line art. Common sense says that this dress is likely to make me look (at best) heavily pregnant. I can’t quite translate the French captions on the website but I’m pretty sure it says something about requiring a slim figure (‘une silhouette mince’) to wear it, which I fear might be fashion editor code for ‘only size zero need apply’. The English-language magazine, incidentally, simply says ‘you will look charming in this dress’. A case of the French editors being more realistic than the Brits? Anyway I can’t help wanting to give this one a go, in a really loud print. Although as it requires three and a half metres of fabric it’s also going to have to be a really cheap print. Not like these John Kaldor ones, beautiful though they are. So am I insane or could this work? I shall certainly be looking out for cheap prints in the next few months. 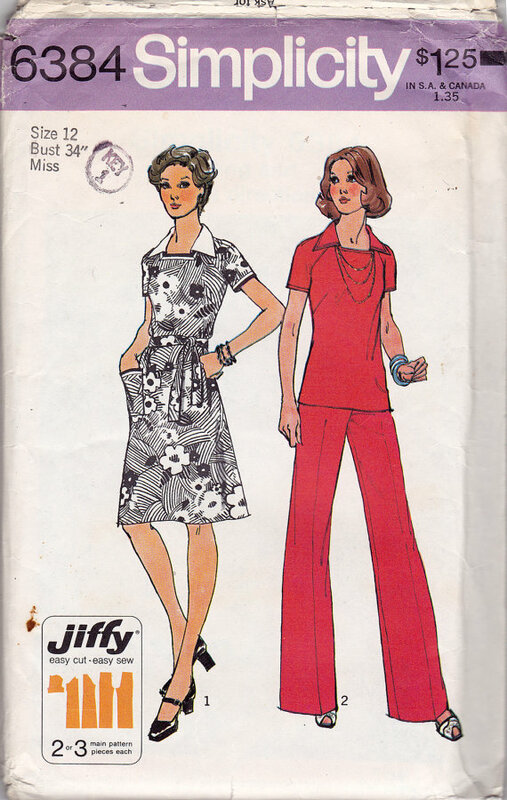 Remember the not entirely successful 1970s jumpsuit project? Elizabeth and Inkstain gave me some great advice about how to fix the problems, and here is the new improved version. I’ve taken in the side seams a lot between the waist and knee, and also shaved a bit off the inside leg above the knee. I also took the centre front seam in a bit below the zip. I found a pair of chunky platform sandals lurking at the bottom of the wardrobe. It’s amazing what a difference the right shoes make with this garment. I tried it with wedges and they looked very strange. This very square heel seems to be just right. And the extra four inches of height probably doesn’t hurt either. Just a very quick post today as I’m writing this on a borrowed computer. I recently bought this amazing 70s pattern on impulse from ZipZapKap. The more I look at this the more I want to make it, insane though it is. I think I’d stick with the colour scheme on the envelope but go for a chunkier zipper. I will spare you the other two views on the envelope. One of them has it made up in a large-scale orange floral which is a little too seventies even for me, and the other’s bright yellow. I just wonder what type of fabric to make it out of. The envelope suggests a bewildering range of possibilities. As well as the things you’d expect like doubleknit, various other knits, and crepe, it suggests novelty pique (sounds scary), denim, and hopsacking. I thought hopsacking was something you made, well, sacks out of. Other slightly less unusual suggestions are wool flannel and linen. My first thought is a very stable doubleknit but I’m worried it will grow. Still, as I have about four projects lined up that I already have fabric for there’s plenty of time to search for the perfect fabric for this one. Plus a big can of hairspray and some platform boots.